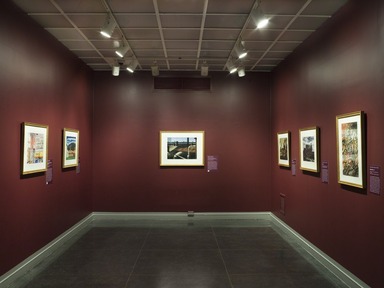 Brushed with Light: American Landscape Watercolors from the Collection presents a selection of eighty American landscapes from the Museum’s extensive and highly regarded collection of American watercolors. 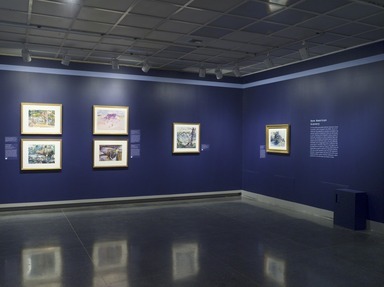 Three distinct but interconnected stories in the history of American art and culture can be traced in this exhibition: the rise of landscape painting and its link to a national identity; the flowering of watercolor; and the growth of the Brooklyn Museum’s exceptional collection. 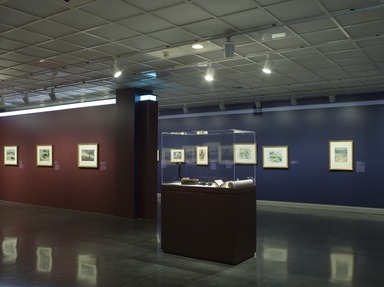 The arts of landscape and watercolor debuted and matured in tandem in the United States. 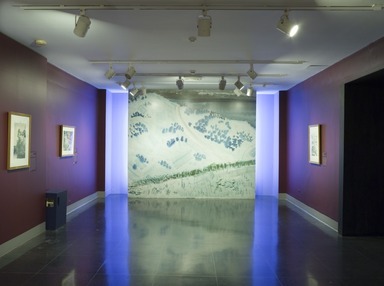 As the idea of American landscape became more complex and varied from the late eighteenth to the mid-twentieth century, so too was American landscape imagery transformed—from the documentary to the evocative, and on to the abstract and newly realistic. Watercolor practice also evolved, as artists mastered and moved beyond painstakingly detailed execution toward the freedom of Impressionist-inspired styles and modernist innovation. The status of watercolor simultaneously shifted from being a medium associated with illustrators and amateurs to one fully embraced by leading artists. 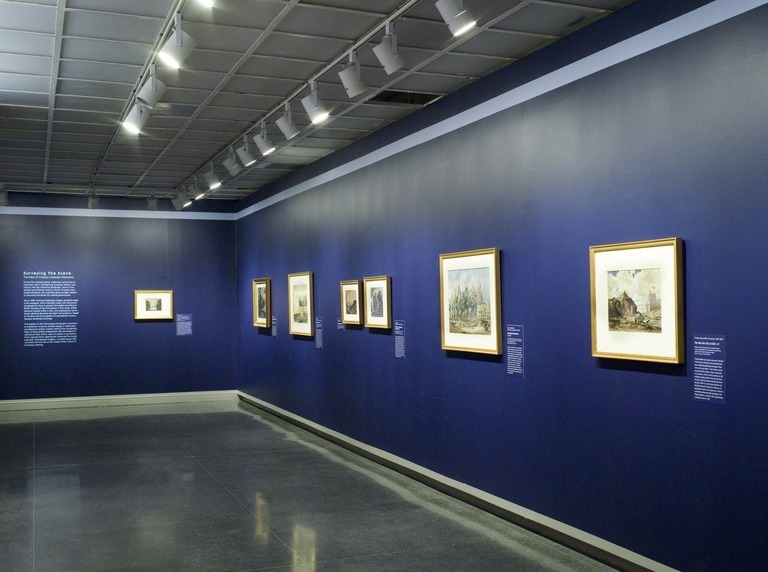 The Brooklyn Museum acquired its first American watercolor in 1906 and went on to lead institutional collecting in the field for much of the twentieth century. Seminal purchases of caches by John Singer Sargent (European subjects that fall outside the parameters of this exhibition) and Winslow Homer were made in 1909 and 1912, respectively. 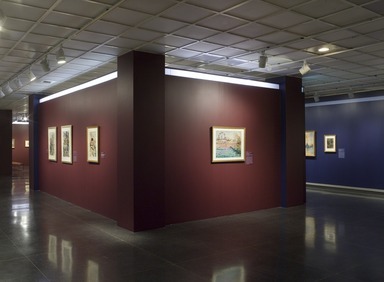 The groundbreaking 1921 Exhibition of Water Color Paintings by American Artists launched a series of biennial exhibitions that ran until 1963, providing the opportunity for forty years of purchases (works that were purchased from biennials are noted here by the symbol on the object labels). 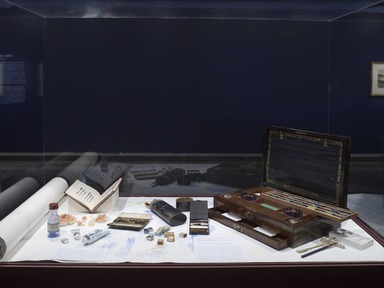 Throughout recent decades, purchases and gifts have continued to enhance the collection. 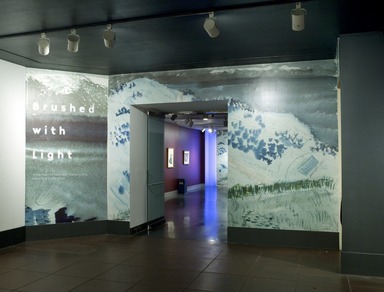 Brushed with Light extends an invitation to experience the vibrant and luminous effects that have long drawn artists and viewers to watercolor. Rendered with a combination of expertise and intuition, the watercolors on display are rather intimate works that draw us close to consider the descriptive powers of their transparent washes, the vivid clarity of their colors, and the light that seems to emanate from within them. During the colonial period, watercolor performed an important role in familiarizing European settlers and visitors with the American landscape. Some of the earliest practitioners active in North America were trained draftsmen who used this easily portable medium to document the terrain for colonial governments. About 1800 American landscape imagery gradually began to be reshaped, with a transition away from panoramic topographical views to scenes formulated according to British theories of the Picturesque. In this mode, artists sketched natural motifs in situ, and subsequently recombined individual elements into ideal “compositions,” based on the lines and tonal patterns of seventeenth-century classical landscape paintings. The leaders of the Picturesque landscape movement in antebellum America worked largely in watercolor, considered an artistic practice distinct from oil painting. Many of these artists collaborated with printmakers to reproduce their scenic views in books or portfolios. 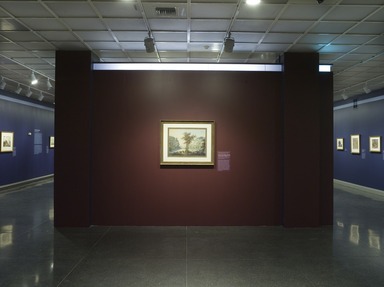 Such reproductions significantly advanced the broad popularity of landscape imagery—a phenomenon that coincided with the rise of the Hudson River School of landscape painting. Attitudes toward watercolor began to change dramatically in the United States in the late 1850s. A major catalyst was the 1857 Exhibition of English Art, which traveled to several American cities and included works by leading British watercolorists. This momentous exhibition heightened the visibility of watercolor as a fine art (rather than a reproductive or amateur one) and inspired American painters in oil to experiment with the medium. 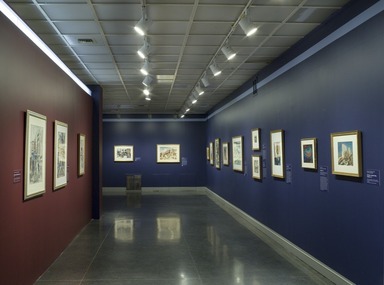 Newly formed professional organizations—most notably the American Watercolor Society (first established as the American Society of Painters in Water Colors in 1866)—provided members with exhibition opportunities and generated enthusiasm for their efforts among critics, patrons, and the public. By the late 1860s, the so-called American Watercolor Movement was under way. One artists’ group devoted to both watercolor and landscape subjects was the Association for the Advancement of Truth in Art (also known as the American Pre-Raphaelites), organized in 1863. Like the British Pre-Raphaelites, these artists embraced the theories of the critic and writer John Ruskin (1819–1900), whose espousal of absolute truth to nature as the underpinning of edifying art led his followers to depict the natural world with painstaking exactitude. The American Pre-Raphaelites in turn influenced less-doctrinaire colleagues to record landscapes in more precise detail. Led by innovators like Winslow Homer and the American Impressionists, American watercolorists broke new ground beginning in the 1880s as they began to explore and exploit the potential of this essentially liquid medium. Many of these artists were members of a younger generation that had been exposed to progressive realist styles during study in Europe. Accustomed to working outdoors (en plein air) and committed to an aesthetic of spontaneity, these painters employed a new freedom of approach in their watercolor practice, recording immediate visual impressions with lively strokes of pure, bright color. As never before, the primary subject of their work became natural light—the way it flickers across landscape forms and changes with shifting weather conditions. The transparency of watercolor washes proved especially well suited to this new concern. Most painters diminished the degree of pencil work that had formerly preceded putting brush to paper, demonstrating a more exuberant directness and a determination to exceed the limits of traditional watercolor techniques. In the early twentieth century, watercolor practice in the United States took divergent paths. While a significant number of painters continued to employ Impressionist techniques that suggested visual immediacy, modernists began to experiment with abstract modes that referred, analytically or intuitively, to the formal structures or essences of their landscape subjects. Watercolor provided an opportunity to create abstractions in which bare paper played as vital a role as the dynamic components of fragmented forms. 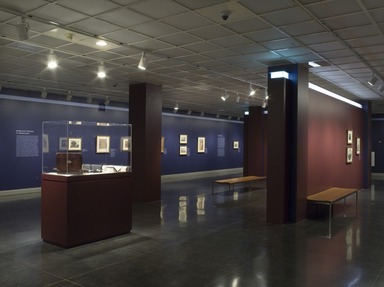 Some leading American modernists, including John Marin and Charles Demuth, were known primarily for their watercolors, in which they employed transparent washes to enhance the spatial play and animation of partial forms. 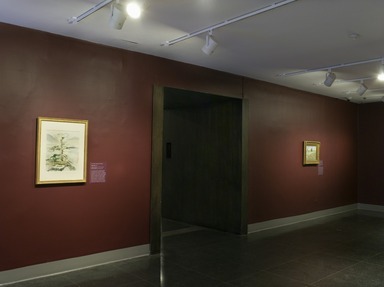 Transcendent modernist landscape watercolors led many critics to suggest that this first American artistic avant garde achieved its greatest originality in the watercolor medium. For the artists associated with the American Scene movement, which emerged in the 1920s, the art of watercolor, long regarded as a practice accessible to all, seemed a perfect complement to their new democracy of vision. Rejecting most nineteenth-century modes of landscape composition as well as modernist ideas and devices, they privileged unvarnished typical American subjects and recorded them with a new and deliberate informality and an exaggerated sense of plainness that could verge on caricature. Drawn to rural regions and the dated forms of small-town settings, artists known as Regionalists sought to embody an essential simplicity that was at times deceptive, given the skill required to describe it. 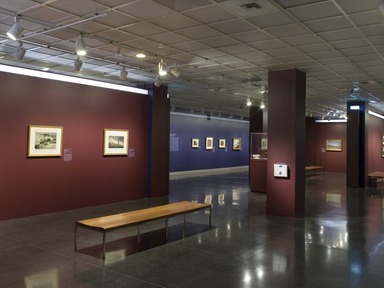 Edward Hopper executed some of the most notable twentieth-century American watercolors, distinguished by a new directness and clarity of vision. 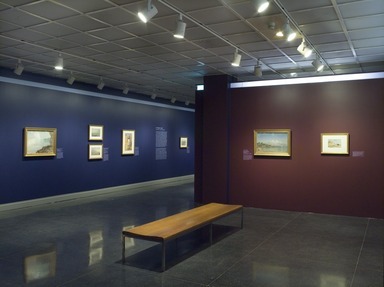 June 4, 2007 Brushed with Light: American Landscape Watercolors from the Collection showcases a selection of eighty works from the Brooklyn Museum’s extensive and highly regarded holdings of American landscape watercolors. 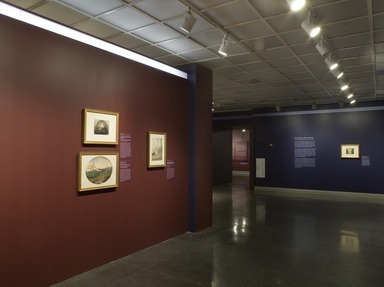 The exhibition, on view September 14, 2007, through January 13, 2008, explores the joint evolution of landscape and watercolor painting in the United States over the course of two centuries. 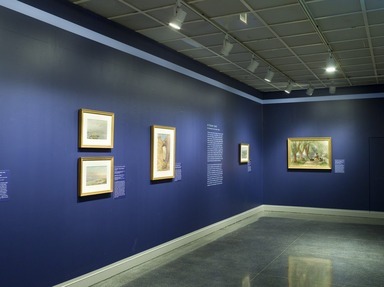 Included are paintings by America’s foremost practitioners of the medium, including William Trost Richards, Winslow Homer, Thomas Eakins, Childe Hassam, Maurice Prendergast, John Marin, and Edward Hopper. 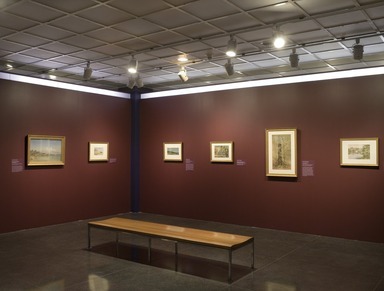 Ranging in date from 1777 to 1945, the works on view are arranged chronologically around the major movements in American landscape art: late-eighteenth-century topographical and Picturesque view painting; the Hudson River School and Pre-Raphaelitism; post-Civil War realism; American Impressionism; modernist abstraction; and American Scene painting. In addition to these sections, there is an introduction to watercolor materials and techniques with illustrative examples. In the colonial period, the American landscape was depicted by the trained draftsmen and watercolorists who recorded sites and terrain for the English and French governments. For such artists as Captain William Pierie (active late eighteenth century) landscape work was an extension of mapping. While stationed in North America as an officer in the British royal artillery, Pierie produced topographical views such as Narrows at Lake George (1777). With its easy portability, watercolor was an ideal medium for this type of documentation. By 1800, American landscape imagery gradually began to transition away from panoramic, topographical views to scenes based on British theories of the Picturesque. This impulse to both document the landscape and to imbue it with Romantic sensibility is evident in George W. Beck’s (1748–1812) Stone Bridge over the Wissahickon (ca. 1800). 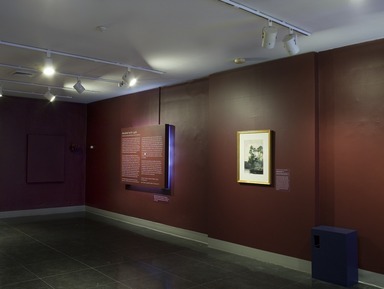 Many of these works were reproduced and circulated in prints and books that, along with the Hudson River School of landscape painting, helped to foster widespread interest in American scenery. A dramatic change in attitude toward the practice of watercolor came about in the United States beginning in the late 1850s with the Exhibition of English Art in 1857, which heightened the visibility of watercolor as fine art. 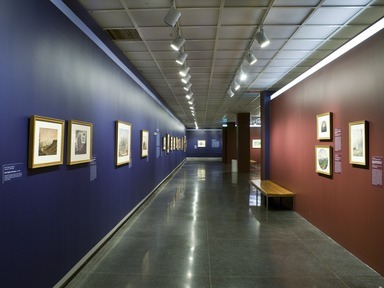 It featured the work of the British Pre-Raphaelites, among them watercolor theorist John Ruskin. Ruskin’s espousal of absolute truth to nature inspired a group of American followers including William Trost Richards. 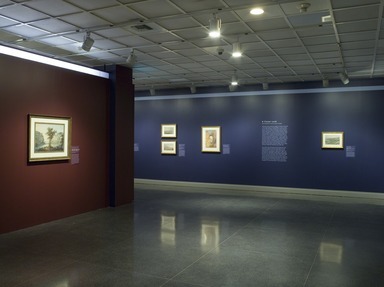 Trained in the Hudson River School idiom and a founding member of the American Pre-Raphaelites, Richards began using watercolor in the 1870s to create naturalistic, highly detailed landscapes based on plein-air studies, as in Rhode Island Coast: Conanicut Island (ca. 1880). As more American artists began experimenting with watercolor, the so-called American Watercolor Movement was underway with professional societies, regular exhibitions, and supportive patrons. Winslow Homer (1836–1910), already established for his realistic illustrations and oil paintings, emerged as one of the leading figures in the movement. In Fresh Air (1878), one of his early forays on the medium, Homer’s working method parallels that found in his oil paintings: he sketched this composition in pencil, then built up the volume of the figure with careful modeling of light and shade. By the end of his career, he was widely acknowledged as one of the greatest masters of the medium. His late watercolors such as Homosassa River (1904) demonstrate both his intuitive approach and technical facility with the medium. Led by innovators like Homer and the American Impressionists, American watercolorists broke new ground in the 1880s and began to explore the potential of the liquid medium. 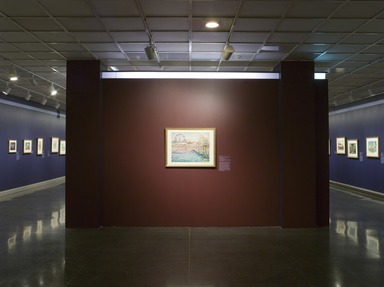 As never before, the play of natural light on landscape forms became the primary subject of their work. Inspired by the progressive realistic styles they saw in Europe, many artists adopted a freer approach to watercolor in order to convey their immediate impressions of nature with lively strokes of pure, bright color. In The Gorge, Appledore (1912), Childe Hassam (1859–1935) captures the fleeting effects of light and color along the rugged coastline of the island off the coast of New Hampshire where he spent his summers. During the same period, modernists began to experiment with abstract pictorial modes that referred to the formal structures or essences of their landscape subjects. 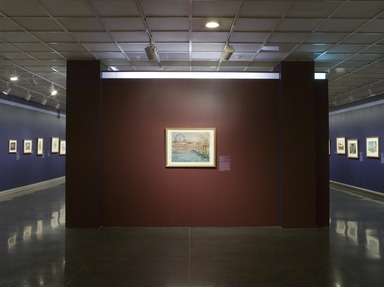 In paintings like John Marin’s (1870–1953) Pine Tree (1917), the bare white paper plays as vital a role as the dynamic components of the composition. Watercolor came to be associated with progressive art in the United States and it was considered a medium in which American artists equaled if not surpassed their European counterparts. 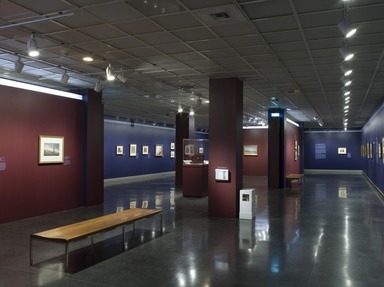 The American Scene Painting movement of the late 1920s–30s rejected most nineteenth-century ideas and devices in favor of unvarnished, typical American subjects, recording them with a new informality and sense of simplicity. 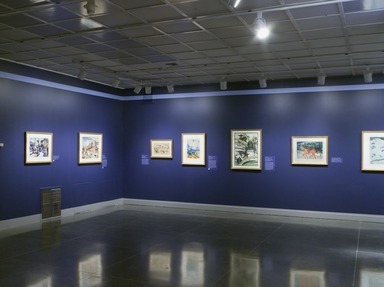 Notable twentieth-century works in this vein include Edward Hopper’s (1882–1967) House at Riverdale (1928) and Thomas Hart Benton’s (1889–1975) Lassoing Horses (1931). The Brooklyn Museum acquired its first watercolor, Coaching in New England (ca. 1876) by Albert Fitch Bellows (1829–1883), in 1906, and went on to lead institutional collecting in the field for much of the twentieth century. 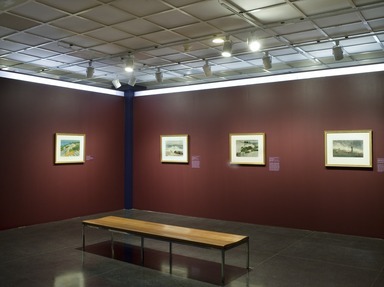 Collecting in the field of American watercolors continues at the Museum today. 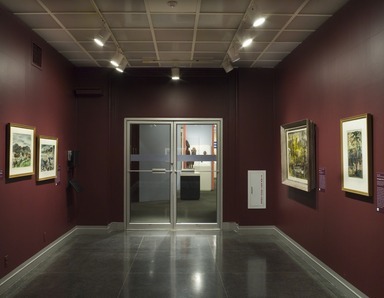 The exhibition is organized by Teresa A. Carbone, Chair and Andrew W. Mellon Curator of American Art. 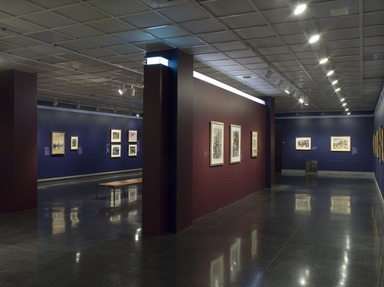 A variety of education programs will be presented in conjunction with the exhibition. Visit www brooklynmseum.org for information.